In this How To we are going to show you with a video and step by step instructions how to apply a really good base for your cosmetics. Now, skin prep is key so you need to exfoliate three times a week and use a really good moisturiser. For a great base, you need foundation, concealer and powder and we're going to start with foundation. So, to test your foundation, put some onto the back of your hand and then test it on your jaw line and then go out and look at it in the daylight, because you can't tell under shop lights. It should disappear into nothing. That's the sign of a perfect colour match. 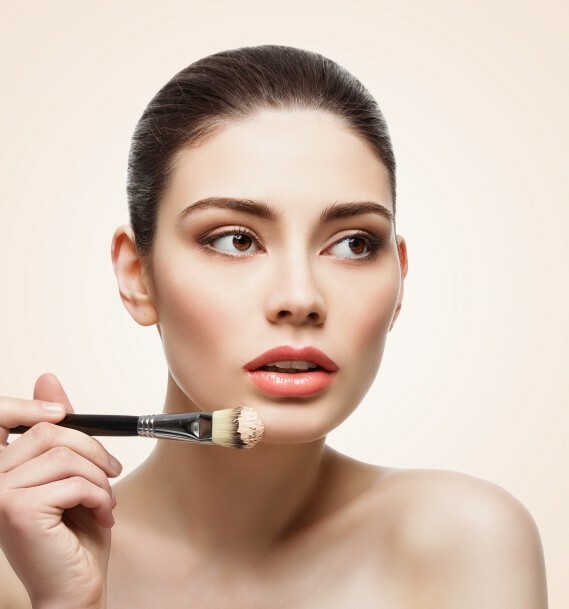 Three different ways to apply your foundation are using a sponge, a brush or your fingers. Apply a little foundation to the back of your hand; I like to use a sponge because it gives a more perfect, lighter finish. So start at the middle of the face, where you'd need the most product and work your way out. Use the product sparingly and only where you need it; foundation is to even out, not to cover. If you apply a little foundation over the eyelids, it makes a great base for eye shadow. Next we're going to apply concealer. I love these roll-on ones because they're really light and creamy and don't dry. You can either put it onto the back of your hand or you can apply directly to the face, which is what we're doing with one of these. So apply to the darker areas of your face; so under the eyes normally, often round the nose and a little bit on the chin. Then take your fingers or sponge or brush and just pat it in. If you pat lightly then you won't dislodge the concealer. then you can apply all over. We're using a really light brush because I don't like to apply lots of powder because it can cake. Lots of compacts come with these pads, I would really avoid using those because you will just cake up your foundation. So, now you know how to apply your perfect base you're ready to apply the rest of your make up.